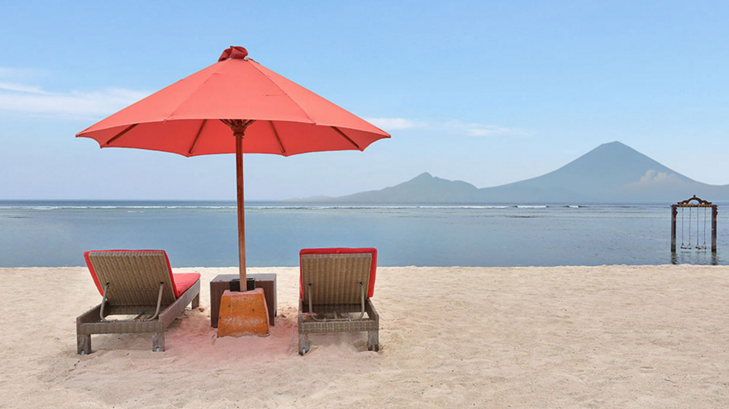 Gili Trawangan is the largest of the sandy land masses and the most popular to visit. It is only a one hour boar ride from Bali and home to Hotel Ombak Sunset. This destination is an essential part of any luxury traveller’s bucket list. Harmony and balance are high priorities for Hotel Ombak Sunset and this peaceful retreat offers guests space and time to fully rejuvenate. In fact, the whole island is very calm. Getting around is only possible by bike or horse and cart, which is a refreshing change from more conventional means of transport and in complete contrast to the busy streets of London. The Ombak Sunset Hotel is located on the west of the island. It offers spectacular views of the sunset every evening, hence its name. The uninterrupted views of the Agung Volcano in Bali are quite extraordinary as tones of orange, pink and red are projected across the sky. An even more iconic feature is the ‘Dtau Swing’ or ‘The King’s Swing’, which is exclusive to Ombak Sunset. This attracts visitors from far and wide, all trying to capture that perfect image, which has become synonymous with Gili Trawangan. 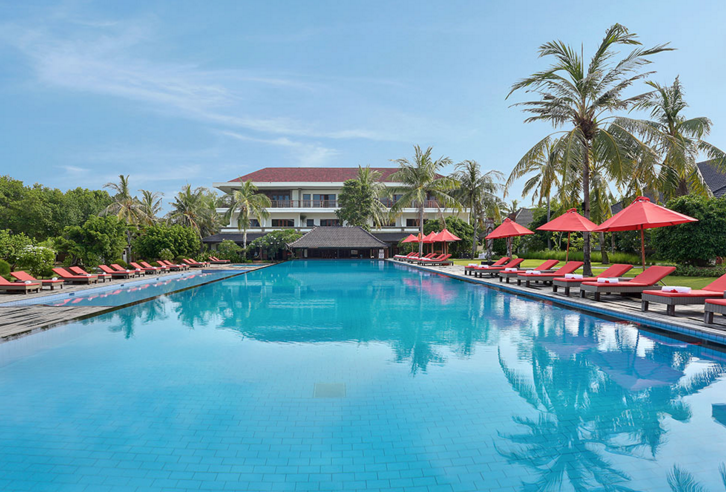 The staff at The Ombak Sunset Hotel create a very hospitable environment; they always greet guests with warm smiles and take a genuine interest in your day, offering bespoke tips to help enhance your experience. There are multiple activities, including horse riding and water sports. You can even spend a day on the water to catch your own red snapper for a BBQ dinner. However, many guests choose simply to embrace the core values of the hotel by relaxing and sunbathing in soaring temperatures of 30 plus. Nicholas, Ombak Sunset’s ‘Boat Man’ (or the Harbour Master as he joked with me) arranged an exclusive private boat trip around the three islands. This was an incredible experience and I had the opportunity to swim with the native turtles and feed exotic fish. Seeing the vivid creatures dart through the Indian Ocean and feed from your hands as you snorkel is an absolute must! 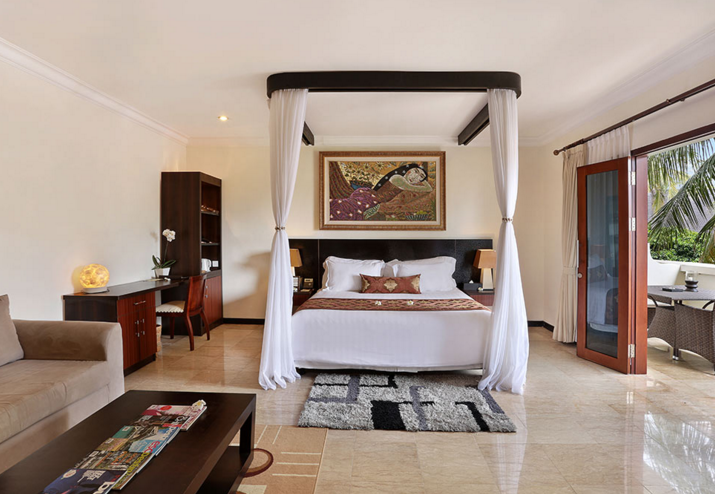 The Ombak Sunset has 150 rooms and two suites, which offer an extra level of luxury. However, all of rooms have wifi, fridges that are packed with complimentary fresh water every day, air conditioning and a TV – although you probably wouldn’t watch this because there is so much to enjoy on the island! A selection of rooms also offer outdoor bathroom facilities, which are welcome in such a climate. The hotel has a choice of three restaurants for dining. They each have different menus and these offer traditional Indonesian cuisine, as well as some typical Western dishes. 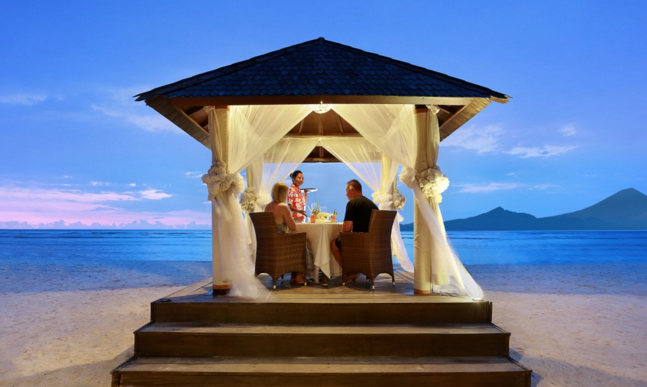 To complement the three restaurants there are also three bars and two of these are situated on the beach. My personal favourite was the floating bar that is located on the edge of an Olympic size infinity pool. This is the perfect place to enjoy a romantic early evening drink. As with most remote Islands, wine and champagne comes at a premium. However, the cocktails are very attractive, especially during the sunset happy hour. The selection is just as good as any top London bar and there is an option to suit all tastes. That said, in this environment, I don’t think you can beat a cold, crisp Bintang, which is the local beer! Although this is a remote destination, there is evening entertainment thanks to the hotel’s efforts. They host a movie night on the beach every night during week and there is also a great live band at the weekend. Given the situation, this is an appealing destination for a wedding and the hotel will host a big event. However, even if there is a big occasion taking place, the property also caters for those wanting to enjoy some quiet time. 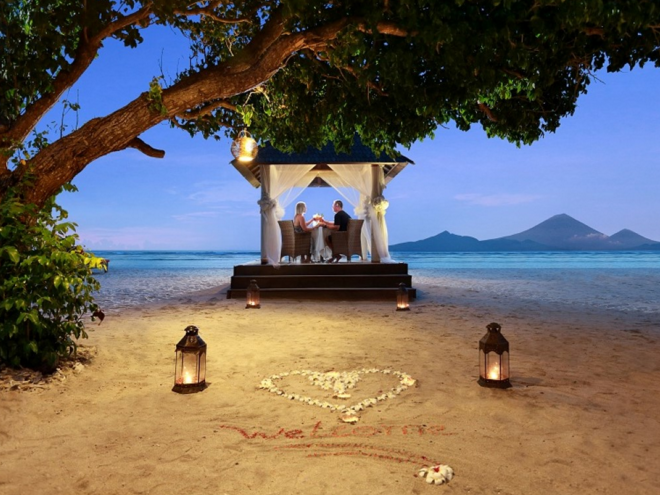 It is ideal for a loving couple and the ‘Romantic Dinner’ experience, which takes place on the beach in their specially designed gazebo, is utterly enchanting. It allows you precious time together to soak up the setting. You can enjoy the signature sunset, while surrounded by the tranquil ocean and white sand. The gazebo is elegantly decorated and you can relax while enjoying a five course dinner that uses the finest, fresh, locally sourced ingredients. No island escape would be complete without a visit to a spa. The Hotel’s Akira Spa has a range of treatments. All of these use local extracts and plants. The unique menu blends Indonesian and western techniques to rebalance the synergy between your mind and body. You can pamper yourself from head to toe with a massage, beauty rituals or spa treatments including manicures and pedicures. Gili Trawangan lived up to my expectations and I loved the slow pace of island life. 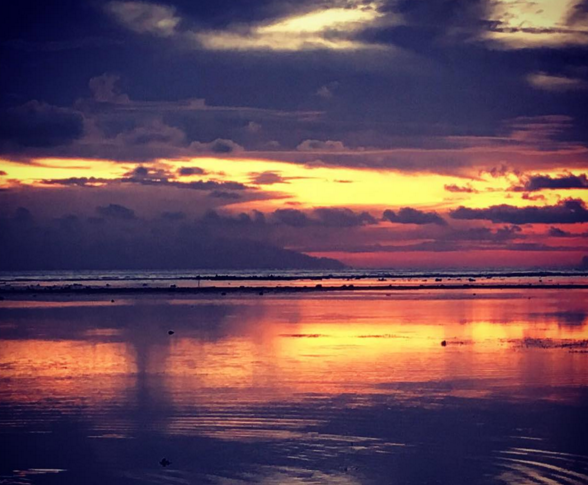 Hotel Ombak Sunset encourages you to unwind and forget the stresses of everyday life. This destination is very romantic and allows you to enjoy some incredible parts of nature. The sunset is breathtakingly beautiful and it is worth visiting for that alone. Find out more about Hotel Ombak Sunset by visiting the website www.ombaksunset.com You can also book a room by phoning +62 370 644333 / +62 81808 644333. 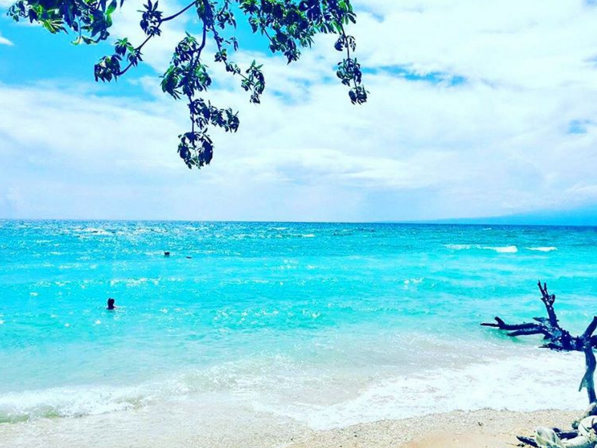 Get more luxury travel inspiration from Sloaney Suites and by following The Sloaney on Instagram and Twitter.